Works by Robert Brooks, Gloria Coker, Dana Jo Cooley, Khate Gausman, Christine Harris, James Warwick Jone, Martha Jones, Sarah Irvin, Kent Knowles, Wayne Devin Llywelyn, Tyrus Lytton, Lee Matney, Linda Mitchell, Glenn Shepard Jr. Paul Thomas, Zuzka Vaclavik, Tom Wessells and more. On the first day from 4:00 -10:00pm Brass Cannon Brewery, one of Williamsburg’s newest craft brewers, will offer samplings of their Red Ale and Stout. At 7:00 PechaKucha Williamsburg will gather for a social hour. At 8:00pm PechaKucha 20x20 presentations will begin. Public is welcome. Visit the PechaKucha Williamsburg Facebook page to learn more. 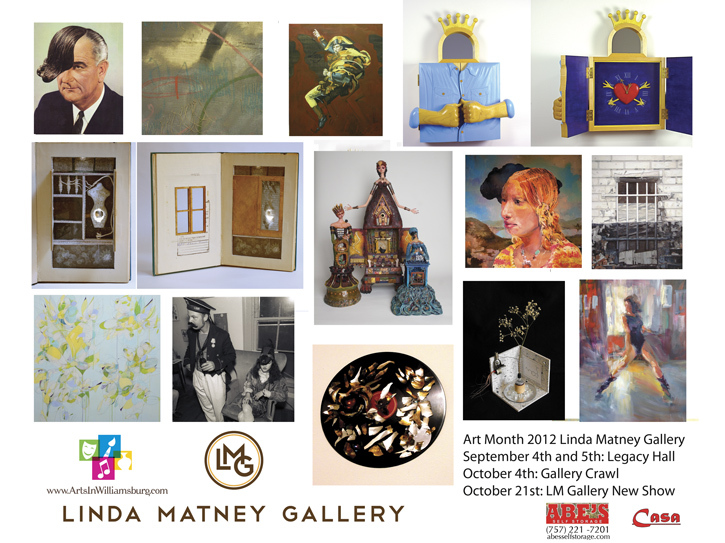 Wednesday,September 05, Legacy Hall, 4201 New Town Avenue 10:00 -8:00pm Linda Matney will present a selection of contemporary works by international, national and local artists (see above.) 5:00pm-8:00pm." New Town Art Stroll " will include, Legacy Hall, Linda Matney Gallery,4301 New Town Avenue 757 67506627, Artcafe26, 5107 Center Street 757 565-7788, New Town Art Gallery, 5140 N. Main Street 757 229-5140. All Festival events are free. for additional information on these events and our 2012-2013 schedule.